About the book: Mindfulness is a powerful antidote to stress, anxiety and panic, chronic pain, depression, obsessive thinking, out-of-control emotions, and many other physical and mental health conditions. This ancient Buddhist technique can help anyone who struggles with fears, worries, and distractions refocus on the present moment and live happily, here and now. 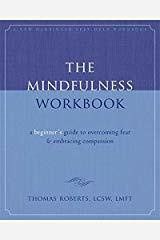 The Mindfulness Workbook is a step-by-step instruction book that guides you through simple practices that enable you to experience mindfulness not as a distant experience or concept, but as an attainable state of being in the world. You will discover the effectiveness of breath work, mindful eating, and thought-watching, and begin reaping the benefits of mindfulness right away. Over time, you will begin to notice that these small changes can bring about a bigger transformation, enhancing your sense of fulfillment and calm.